Eden Hazard was a major factor in Chelsea winning the Premier League 2014-15 and his performances were rightly regarded as the best from that campaign. It saw him crowned as the PFA Player of the Year. However, he has been one of the biggest disappointments in the 2015-16 season. Former manager José Mourinho and current manager Guus Hiddink were unable to explain the massive dip in form experienced by the Belgian international. Some saw this as a sign that the player was trying to engineer a move away from the club with the likes of Paris St Germain and Real Madrid showing interest. Chelsea are set to replace Branislav Ivanovic this summer as the club searches for his replacement. With incoming coach Anthonio Conte given a huge task to lead the team to glory, he wants to revamp the team to his taste meaning players like Ivanovic could leave the club or get set for fewer appearances at Stamford Bridge in the coming season. Conte is currently on official duty for the Azzurri’s Euro 2016 campaign but will resume at the club immediately the tournament ends. The 46-year-old spent three years in charge of the Old Lady before he stood down to take on the challenge of managing the Italy national team. He worked with Stephan Lichtsteiner during his three-year term guiding Juventus to three successive Serie A titles. Chelsea are reported to be close to signing FC Porto winger Yacine Brahimi, although his club have admitted to being in talks with other clubs, as the Blues try to add more players to the club this summer. The deal for Brahimi is a tough bidding war, but the club are confident of convincing the player to join them at Stamford Bridge, according to reports by Portuguese website O Jogo. Wolfsburg, AC Milan, Premier league rival Liverpool and others are keen on landing the highly-rated Algerian winger this summer, but Chelsea hope to complete the deal within a few days. According to the reports, the deal is in advanced stages and Porto want £30million for the player. However, the club has a poor financial position and has issues with the Financial Fair Play rules, hence a fee of £15m looks more likely. 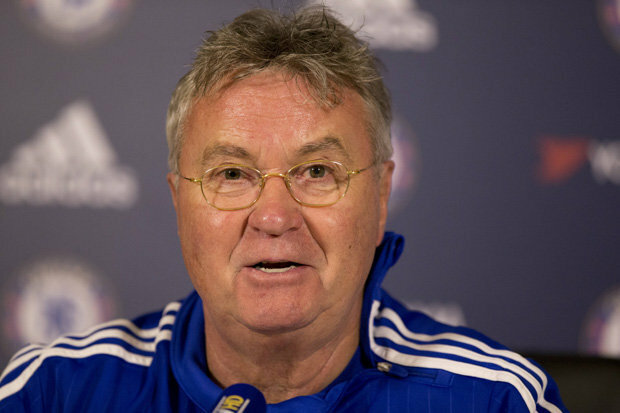 Guus Hiddink believes that Monday’s opposition Tottenham could be affected by nerves as they are involved in the title race for the first time. Spurs are the visitors to Stamford Bridge and they will be looking to keep in touch with Leicester City at the top of the table. After a 1-1 draw with Manchester United, Leicester have moved one step closer towards the title. Tottenham could have been in a much better position had it not been for the draw with West Brom at White Hart Lane. This was a deeply disappointing result that allowed Leicester to go within three points of the title. This season has been a questionable one for Chelsea, and one that they would undoubtedly prefer to wipe clean from footballing history. Having started off with a terrible 2-2 draw against Swansea, the club appeared to set the tone for what would be their form for the rest of the season. Not only was morale already low, but with the combined toxicity of the atmosphere surrounding Jose Mourinho's management status a negative vibe hounded the team. As if ‘the season to forget’ wasn’t enough for Chelsea fans to bare, there are rumours presently doing the rounds that hint at Diego Costa missing out on Euro 2016.